One of the most beautiful and highly improved farms in the Redrock Valley is that of R. A. Bowden, twelve miles north of the city of Perry. This is Mr. Bowden's first experience as a farmer. He has been engaged in the mercantile business for a number of years. He was fifteen years in business in Grenola, Kans. Mr. Bowden is a native of West Virginia, served in the Union army of that state, and upon his return home vas elected sheriff of his county. His valuable claim was secured by filing a soldier's declaratory statement. His place is all bottom land with thirty acres of fine timber. He averaged sixty bushels of corn to the acre this year, besides raising many other valuable crops. Mr. Bowden has a fine family of six boys and three girls, and is one of the substantial citizens in the comnmnity. The above is a splendid likeness of the subject of this sketch - the Hon. 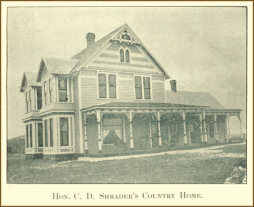 C. D. Shrader, whose beautiful home lies one mile west of the city of Perry. On another page will be seen a picture of his residence recently completed. Mr. Shrader has a half section of excellent land and from his sightly residence is a grand view of the city and surrounding country. Strangers wonder at the marvelous growth of Oklahoma cities and towns. A drive into the country is a greater surprise and this is as it should be. In an agricultural country the rural should lead the urban growth. It is less than three years since Mr. Shrader came to Oklahoma entirely without means and his magnificantly improved farm shows what energy and rustle will accomplish in ''The Land of the Fair God." Mr. Shrader is a born farmer and his highest ambition is to be a thorough, scientific and successful one believing with Washington that "Agriculture is the most useful, most healthful and most noble employment of man." He is a farmer, not from necessity, but from choice, as he is thoroughly qualified to successfully prosecute any business or profession. His farm is now fully stocked with draft and trotting horses, Jersey and Holstein cattle, Chester White hogs and Plymouth Rock chickens. He has more than a thousand of the choicest budded peaches ripening from June first to past the middle of October, besides apples, pears, cherries, plums, apricots, grapes, berries, etc., etc., (sic) in abundance. While living in Nebraska he originated a most excellent variety of Indian corn which won first premiums at all the western fairs and at several national corn exhibitions. Such men are neeeed to build up new commonwealths and Oklahoma is proud to have them within her borders. 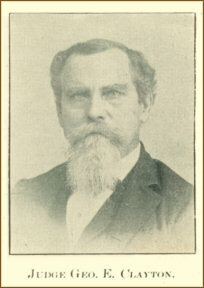 Mr. Shrader was born in Lancaster, Wisconsin, where he resided till thirty years of age when he removed (sic) to Nebraska and rented near Lincoln. where he resided till 1884 when again getting the western fever he located a colony of old soldiers in western Nebraska and organized Logan county, being one of the first county commissioners. Here Mr. Shrader engaged in stock raising and farming on a large scale - having near a section of land under the plow. He kept a high class of stock - English Shire horses, Short Horn cattle and Poland China swine. In 1890 a series of unprecedented droughts began which, coupled with falling prices generally, swamped him financially and in 1895 he removed to Oklahoma without means and began where he had begun once before thirty years ago - at the bottom of the ladder. Such men do not stay down long. Pluck, energy and perseverence are exhibited upon every feature of his countenance and their result are dearly seen upon every acre of his farm. For many years Mr. Shrader has been a student of sociologic, philosophic and economic questions and early saw the danger to business and labor from the encroachments of aggregated capital organized in corporations and trusts and took an active part in every movement looking towards bettering the condition of the farmer. He was foremost in organizaing the Farmers Alliance in Nebraska and was chairman of the executive committee of the first state Alliance. who will speak in Exposition hall tonight was one of the 'farmer legislature,' the only legislature ever elected in Nebraska that would listen to the voice of labor. He being one of the most prominent men in that honorable body, that alone should be enough to insure his election as Lieutenant Governor, but aside from that he has always been on the side of down trodden and oppressed people. The malicious attempt of the Republican part leaders in this state have drawn the honest voters closer to the people's choice. Mr. Shrader has the confidence ofthe people of this state to such an extent that the combination to defeat him will surely fail." "C. D. Shrader has departed from Nebraska with a view of seeking a new home in Oklahoma. Now that he has gone where he cannot take a hand in Nebraska politics let us accord to him what we would not withhold from the dead and give him such credit as he merits. In the first place Mr. shrader was an able man intellectually - and a strong man physically. He was a reputable citizen, and the only serious charge made against him was that concerning his cranky notions in politics. In politics, however, he was unlucky. At the Columbus Congressional Convention he was a conceded winner until, in an evil moment, he had some tickets printed for use of the delegates in voting for him as their choice. When these bits of paper appeared it was playfully remarked that Mr. Shrader belonged to the old school of politics and was a dangerous man for the convention to nominate. This sentiment uttered in a joke was taken seriously, and, strange as it may seem, it is nevertheless true that the printing of those tickets cost Mr. Shrader the nomination, and he has forgotten more on economic questions than Mr Kent ever knew. 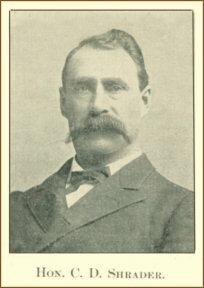 He then returned home and was nominated and elected to the legislature which met in 1891. He then became a candidate for Speaker of the House. He was unquestionably the ablest man in his party in that body, and the greatest mistake the Populists made in this state was when they turned him down and elected Elder. One can only imagine what the outcome of that celebrated conflict of authority between Meiklejohm and Elder would have been had Shrader been Speaker. The result might have been the same, but with the tremenduous majority held by the Populists with a man of nerve to lead them, they could have tied the minority in a sack before they had time to appeal to the supreme court. Such a man Mr. Shrader would nave been, and with him in the chair one of the incidents of that contest would have been a stand up and knock-down contest between the presiding officers of the House and Senate. The Poputists had an opportunity but were unequal to the occasion through lack of a competent man to lead them. They had such a man in their ranks but they ignored him and saw their mistake when it was too late." Mr. Shrader says since he left there is the first time a Nebraska Republican paper ever spoke well of him. Although he has engaged somewhat in politics he says he is never so happy as when, dressed in blue drilling overalls and patches, he is engaged in cultivating his corn. pruning his trees or feeding his stock. May Nebraska send us more like him. The subject of this sketch was born in Clark county, Missouri in 1834. His father early removed to Madison county, Illinois, and the young man was educated at Slamtleff college. became a school teacher at twenty years of age, studied law and emigrated to Brown county, Kansas, in 1856, located the county seat of that county, which was first called Claytonville, in honor of its founder. Mr Clayton was a leader in politics. even in that early day, and was soon after appointed postmaster at Claytonville and also elected judge of probate of Brown county and ex-offico chairman of the board of county commissioners. He was admitted to the bar as an attorney in 1860. In 1862 he enlisted in the Civil War and served with distinction three years in the 11th Ohio volunteer cavalry and was honorably discharged in April, 1865. Afterwards entered largely into agricultural pursuits and practiced law in Brown and Nemeha counties, Kansas. In 1885 he was appointed postmaster at Willis, Kansas, under Cleveland's administration. Resigning in 1889 he came to Oklahoma and located on a fine claim in Logan county near Waterloo. Again entering politics he was shortly appointed commissioner of deeds for Indian Territory and in 1890 was nominated on the Democratic ticket for representative of Logan county. In 1891 he patented his farm and began the practice of law having. in the meantime, been admitted to practice in the supreme court of the Territory. Judge Clayton was a prominent candidate for special agent of the general land office and had probably the strongest endorsements of any one in the Territory for that position, but the policy of the adtninistration to select an outside man for that position alone defeated him. He was, however, endorsed for and received the appointment of postmaster at Waterloo. Subsequently his friends urged his appointment to a position in the organization of the "Strip" counties and he was given the choice between the county attorney in "N" county or justice of the peace in Perry, Noble county. He chose the latter, and it is but justice to Geo. E. Clayton to say that none of Gov. Renfrow's appointments for this county gave better satisfaction than that of Mr. Clayton. He was especially suited for the position, having a knowledge of the law and being very fair and impartial in the conduct of his court, it is universally admitted that no appointment of the Governor's has made a cleaner or more honorable official record than that of Judge Geo. E. Clayton. Perry has a most kindly interest in the young men who have began their business career in this city, and everyone naturally wish them success in their undertakings. It is from the young blood that enterprise is infused into the commercial life of a town and it is largely to them that we look for the future prosperity of Perry. Knox Bros. have shown their business tact and ability by the side of older concerns. By their push they have established a large trade. They began in the grocery and "racket" store business, but seeing an opportunity to purchase a large stock of cclothing, shoes and furnishings at a price much under the real value they snapped up the bargain and are now giving their friends and customers the benefit of it. They have added large invoices of new goods to their already large stock and they are now prepared to furnish anything in the line of clothing, shoes and furnishings at prices of special interest to buyers. Knox Bros. have made their influence felt upon the Bear side of the local clothing market and the people will give them credit for it.